On the 9th and 10th of November 2018 our copy of the organ shown on an inlay was festively inaugurated. Catalina Vicens, who will play the organ in the future, has played the inauguration concert together with Jankees Braaksma. 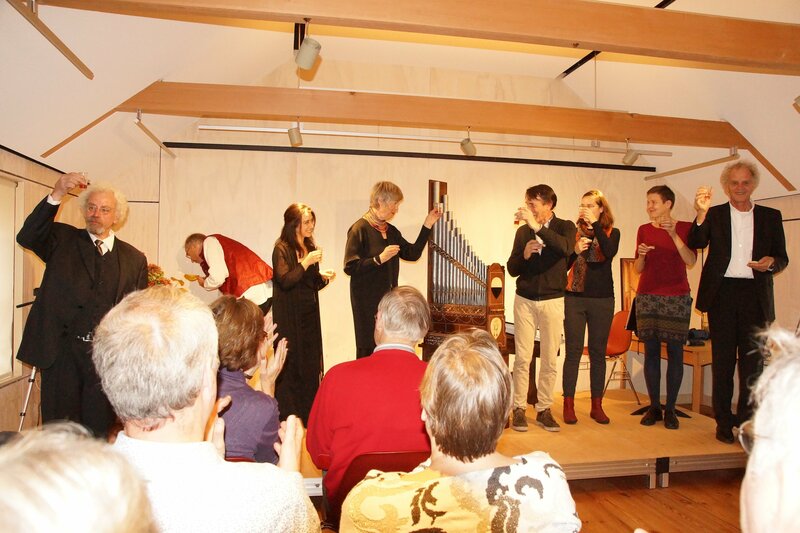 The organ builders Ingrid Noack-Kirschner and Winold van der Putten served the bellows. Also Bianca de Goes and Iskander Breebart from Amsterdam, who carried out the inlaid work, were there. 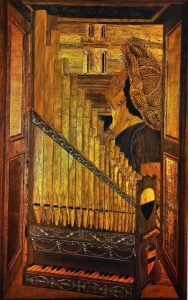 The model for this organ is an inlaid panel, which was made in 1485 by a very knowledgeable intarsia artist named Antonio Barili (1453-1516). For the Cathedral of Siena, he made 12 panels for the St. John the Baptist chapel, among which: “Tarsia con organo e figura in ascolto”. Today, the panels are exhibited in the church of St. Quirico. A very Dutch couple that is very interested in music, commissioned us with this work, because of our experience with this type of reconstruction of organs. It was very important to them that all the work would be done as historically as possible, as the instrument is destined for the scientific organist and harpsichordist Catalina Vicens from Basel. Jankees Braaksma assisted us as an expert and Liuwe Tamminga from Bologna also advised us. We analysed the Intarsia on the used measurements. We discovered a Quirico foot with 12 thumbs. In this way we could get logical relations between all components. 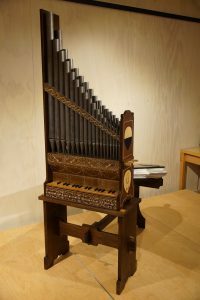 Liuwe Tamminga has found evidence for the hypothesis that the pictured instrument was made by Laurenzo da Prato, the organ builder who also built the famous organ in Bologna San Petronio from 1471 to 1475. 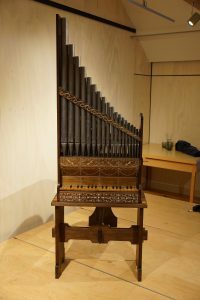 Stylistically this instrument stands out because the outer form is still gothic, but the ornamentation belongs already to the Renaissance. This is especially true for the ornaments above and below the keyboard. On the short side are two coats of arms, the upper one is the coat of arms of Siena, the lower coat of arms belongs to the original customer Alberto Aringheri. 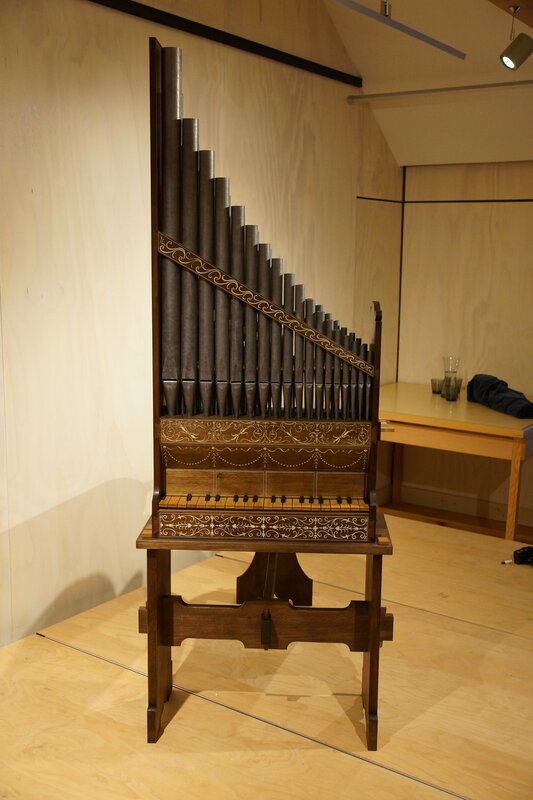 Who compares example and executed organ will find, that our replica is decorated with a different coat of arms: our present clients have chosen a wild tulip for the coat of arms. the foremost and the furthest slider serve the “principale,” which is not disposed twice, but alternately set up; f stands in the front, g in the back, a in the front, b in the back etc. The small pipes are clearly visible in the picture, the compilation is our interpretation. In Gothic dispositions, it is common to double voices as soon as the space is available. This increases the intensity of the sound, but not the volume or the tone colour. The second slider from the back serves a much narrower Ottava. 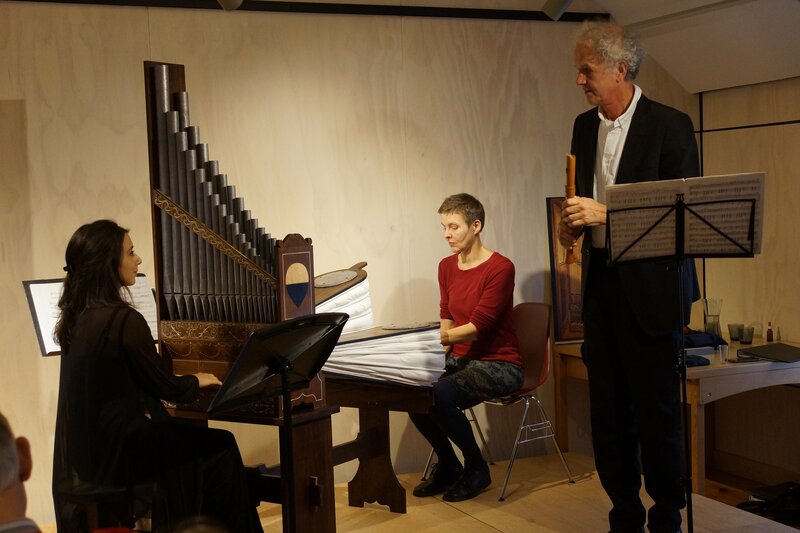 At the special request of Catalina Vicens, the second slider from the front serves a reed stop with a short resonator, which we made in reference to the Klotz instrument from the Germanisches Nationalmuseum from the first half of the 17th century. These small brass resonators hang in front under the wind chest and can be tuned after removing the board above the keyboard. At first we could not explain the black keys to the right and left of the keyboard. Liuwe Tamminga explained us, that these types of keys were used for extra sound effects. 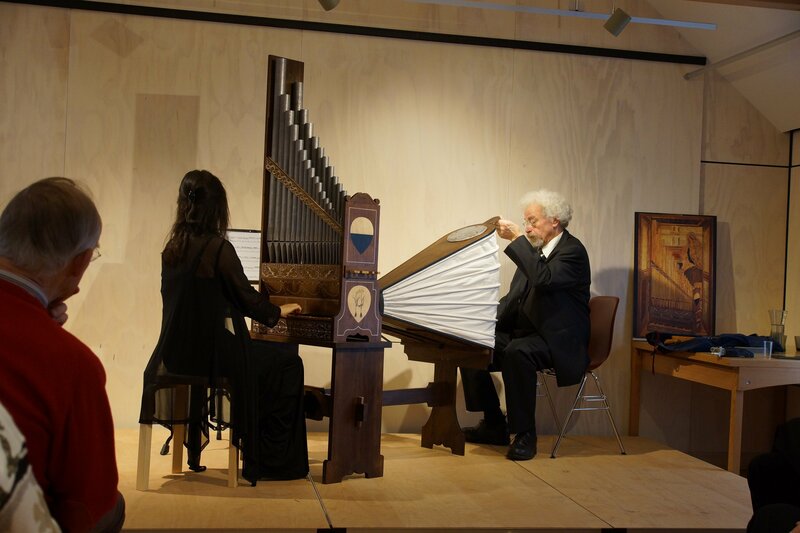 On the left is a nightingale “Rossingole” with two pipes and on the right a cricket “Grilli”. The range of the keyboard is: fº, gº, aº, bº, hº, c¹, cis¹ and then chromatic to f³.